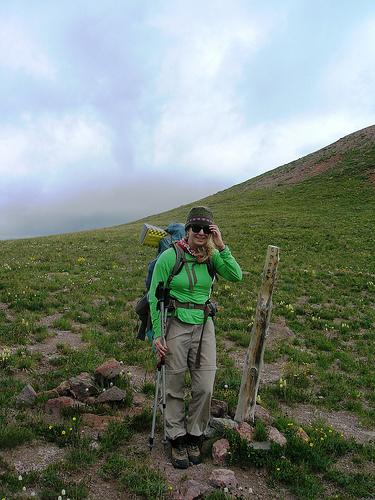 In March, several years ago, I went on my first backpacking trip. Destination: Canyonlands National Park outside of Moab, Utah. As you may know, it’s a desert environment. Temperature-wise, the weather was ideal, but rain was non-existent and water sources were, at times, dangerously scarce. Since then, most of my backpacking excursions have been similarly dry, at least in one respect: nice daytime temps and little to no rain, but fortunately, fresh-flowing streams near every campsite. Dream conditions for backpackers (this one, anyway). My lucky streak ended last summer when I was caught in what objectively could be called the mother of all hail storms while backpacking Colorado’s Weminuche Wilderness. 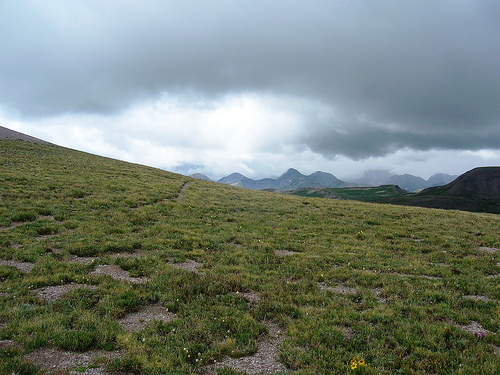 Making matters worse, I was above tree line at around 12,000 feet when the storm began. (Meaning: I was the tallest object around, and so if lightening started…) The sky unleashed so much hail so quickly that I was soaked before I could put on my waterproof pants and jacket, which like a good backpacker, I had stashed in an easy-to-reach area of my pack. But, like a bad backpacker, I had sloppily tied a lot of gear (sleeping pad, hiking poles, an old shoe I found the day before) to the outside of my pack. As a result, the waterproof pack cover I bought before the trip didn’t fit over my now-ridiculously oversized, misshapen backpack. And for the first time in a long time on a backpacking outing, I cried. Big, fat tears mixed with cold raindrops clung to my cheeks as I realized with genuine horror that all of my belongings—from my clothes, to sleeping bag, to thermal underwear, to fleece jacket, to medications, to food—were not just getting wet; they were saturated with water. My predicament wasn’t just uncomfortable, it was downright dangerous, and it could prove deadly. Missed warning signs aside, part of my predicament can be blamed on being ill-prepared, but maybe only regarding one piece of gear. (Otherwise, I’d say I was very well-prepared in terms of not only material goods, but also physical conditioning). Simply, my pack cover didn’t fit that day because my backpack had so much gear lashed to the outside. Making this kind of mistake is both irritating and odd, as it’s my policy on “major” outings never to use new, untested gear or to alter big habits such as packing style. Local, shorter outings, on the other hand, are better suited for that kind of experimentation. That being said, I don’t think I can attribute my Weminuche mishap entirely on ill-preparation. Simply put, I wasn’t paying attention, and I paid the price. I had been in the Weminuche for four nights and five days and knew to expect a thunderstorm with a heavy rainfall in the mid-to-late afternoon. On the first day, it started to rain as I set my tent up; on the second day, it rained after dinner; on the third and fourth days, it poured right as the dinner crew began their prep-work. Thunder and lightening were present during part of these storms, as well. How could day five be any different? Our seasoned, well-trained wilderness adventurers–Sierra Club Outings volunteers–knew to expect poor weather and altered our schedule accordingly. On day five, we broke camp very early in the morning in order to reach our next site before the afternoon storms rolled into the Weminuche. Arriving at our destination at this time posed a concern because we had a long, arduous hike to get there: it required crossing two passes linked by a trail that, at times, devolved into a cliff-hugging, scree-filled scratch of earth. Navigating this path would be slow going, not only because of the scree, but also because ascending two passes meant gaining (and then losing) altitude twice; hiking such a route takes time and energy, and it poses its own dangers beyond these concerns, as well. In our case, we’d be exposed above treeline for a longer period of time–the exact place you don’t want to be in an electrical storm. As I we maneuvered across the second scree field and towards the final pass, the temperature fell rapidly, the sky darkened, and the wind picked up speed. Moreover, the atmosphere had a heavy, laden-with moisture feel–you know, the way the air feels right before it’s going to rain. Still, I carried on, putting one foot in front of the other. Why did I unintentionally ignore and misinterpret signs that heavy rain was near and that I needed to prepare my belongings before the weather hit? What was I thinking? While I’m sure I could look to a variety of literature and fields (e.g., survivor studies) for answers, I like Laurence Gonzales’ Deep Survival: Who Lives, Who Dies, and Why. I think his text offers some pretty compelling explanations for my illogical behavior–actions that prompt one (myself included) to ask, “what was she thinking?” Yet, Gonzales would say that the absence of rational thought is precisely the point. I wasn’t thinking. Extra goodies: Did you like the first part of this post (i.e., before the jump)? I created it as part of my Blog Lab series in a entry exploring the connections between blog post opening gambits and introductory paragraphs in academic writing.